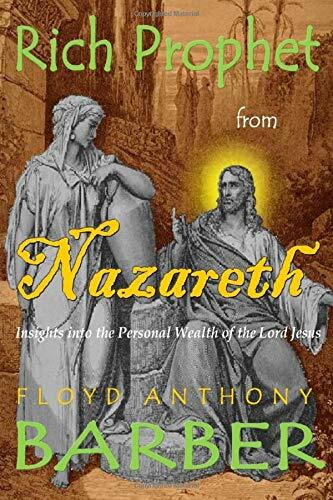 In 'Rich Prophet From Nazareth,' Prophet Barber takes the reader on an odyssey in long-overlooked truths concerning the personal wealth of Jesus Christ. Myriad sacred cows are kicked over as the prophet exegetes the Word of God concerning the covenant with prosperity every Christian has with the Creator because of Jesus's vicarious sacrifice on Calvary. Your faith for finances will increase in ways you never thought possible as any and every mental stronghold is dissolved by the power of God's Word rightly divided. Prophet Floyd Anthony Barber, Jr. was born in Harlem, New York City. While he was yet young and tender, he and his family relocated to the quaint suburb of Summit, New Jersey. It was there that Providence preserved him until the appointed time of his ministry. At the age of 19 he received Jesus Christ as his Lord and Savior. Shortly thereafter he had an angelic visitation in the night. He then knew that he was called to do a work for the Lord. Since that time, Prophet Barber has gone on to become an ordained minister. His prophetic ministry flows with balance and accuracy, whereas his teaching ministry is punctuated with depth and clarity, being confirmed by various charisms of the Spirit of God. Prophet Barber has traveled throughout the United States ministering in churches, tent meetings, colleges, and universities. He has also held associate and senior pastor positions in New Jersey, Missouri, Virginia, California, and Georgia, in addition to faculty positions at Ekklesia School of Ministry and the Dr. Dorenza A. Gerrell Institute for Biblical Studies. In 1998, his radio program--The Princetonian Prophet--was the most popular program on WIMG 1300 in the Greater Trenton Area. He was also a featured columnist for Philadelphia’s Anointed News Journal and Newark’s Visions newspaper. In 2014 Prophet Barber relocated to Norfolk, Virginia where he now resides as the chief executive officer of The Prophetic Society.